The cup is the fastest and sometimes easiest way to qualify for the European Cup. This scenario is mainly conjured up by the clubs, which probably can not develop an international starting right over the Bundesliga. After that, it looks currently also for the two Cup rivals Schalke 04 and Fortuna Dusseldorf. This is not a big surprise for the Fortunas. As a climber, the league first and foremost counts. Larger targets were not issued by Friedhelm Funkel. The Schalke, of course, have toyed with qualifying for the premier class again. At the moment both teams are tied and have 22 points in the account. The Schalke are, thanks to the better goal ratio, in twelfth place. Düsseldorf is ranked 14th. But there is no acute descent at the moment because the cushion to the relegation place amounts to seven meters. The Schalke were on the right track and have qualitatively more to offer than the Fortuna, which is why we tend to dare between Schalke and Dusseldorf a tip on the hosts. However, Schalke plays his very existing class far too rarely. It is not a gift to be a fan of the miners this season. Coach Domenico Tedesco is much blamed and head of sport Christian Heidel is also criticized. But that will be left out on Wednesday, because the move to the quarter-finals in the DFB Cup would be at least a glimmer of hope. 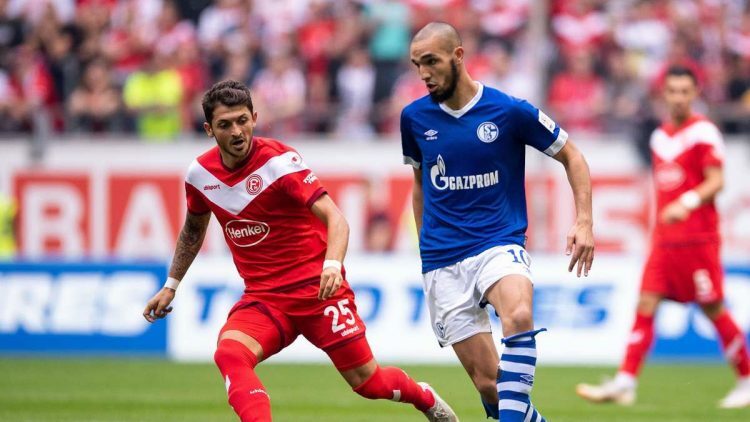 The bookmakers offer in the match between Schalke and Dusseldorf lower odds on a home win, but the Fortuna has proven this season several times that they also abroad is able to beat well against supposed favorites. In the Bundesliga some points have jumped out in foreign places. Maybe on Wednesday also the surprise in the DFB-Pokal succeeds. There is a crisis in the Schalke at every nook and cranny. The Royal Blues have fallen far short of expectations this season and have not managed, despite record spending, to put together a powerful team. Basically, the season had already run after a series of fouling at the beginning of the season. Especially the home weakness is a big problem on Schalke. Six of the ten home games in the Bundesliga were lost. This is the worst result in 51 years Bundesliga. At the moment everything seems to have conspired against Schalke. The cup is basically the last chance to make this season still reasonably positive. In the Bundesliga seems a catch-up hunt currently excluded. In the winter, the miners have staffed once more staff and now want to look to make in this series but a step in the development, and then attack again next year. Therefore, a victory in the cup would be enormously important. Domenico Tedesco and his players know what struck the hour. Therefore, we would dare, despite the home-misery, in the game between Schalke and Dusseldorf rather a prediction in favor of Schalke. However, there was another defeat last weekend in front of their own audience. Borussia Mönchengladbach, however, also hosted a top team, who showed the squires the limits. For a long time it was 0: 0, even in a minority after a dismissal for keeper Alexander Nübel Schalke could keep the case clean at first. Only in the final phase of the Borussia get two goals for away win. This defeat must be ticked off. Daniel Caligiuri is already focused on the trophy and makes no secret that he wants to win the title in this competition. On Wednesday the Schalke will have to go into the match with reduced replacement. Alessandro Schöpf, Steven Skrzybski, Benjamin Stambouli, Guido Burgstaller and Breel Embolo will miss injured. The question will be whether Alexander Nübel, who is suspended in the league, will be replaced by Ralf Fährmann. Actually, sunshine prevails in Düsseldorf. As a climber, the Fortuna beats so far more than respectable. Only the topic of the contract extension of Friedhelm Funkel has brought the club a small image damage. The reputed coach repairs this in person, with courageous performances in the Bundesliga. Especially abroad, Dusseldorf is a fire hazard. For example, in Hoffenheim and Munich, one point could even be abducted. As a result, Fortuna does not travel to Schalke without ambition. In the last three away games in the Bundesliga Dusseldorf brought a great seven points. The team usually acts very bravely and ultimately rewards themselves for the fearless performances. Similarly, we expect the Fortuna on Wednesday at Schalke. Although the game has already been handed down at the draw, the team of Friedhelm Funkel is likely to sniff morning air. One reason for this might have been the great game last weekend in Hoffenheim. Dusseldorf was the pleasing team and the Kraichgauer were happy in the end that it was enough for the draw to a 1: 1 draw. Although the hosts went after a quarter of an hour penalty by 1-0 in the lead, but with the break whistle Rouwen Hennings was able to compensate for the 1-1 final score. A deserved point that was brought with a lot of effort. That’s why Friedhelm Funkel will be shooting in the cup on Wednesday. But that does not mean that he would not get any chances on Schalke. In goal, Jaroslav Drobny will make his debut for the Fortuna. Overall, we expect Dusseldorf a little more defensive than on the weekend. The two Poles Marcin Kaminski and Dawid Kownacki could certainly play a role in the considerations of the coach, who would like to beat the opponent before the kick-off between Schalke and Dusseldorf, despite the odds, like a trick. It’s not a derby in the traditional sense, but Gelsenkirchen and Dusseldorf are not far apart. Therefore, in the early days of German football at the regional level, there were already many duels between these two clubs. To date, there are 81 mandatory games to book. In a direct comparison, the Schalke are with 40: 21 victories at 20 draws ahead. Fortuna was a guest of Schalke five times in the Cup and has always lost. Also the last meeting between the two opponents went to the miners. The first leg in the Bundesliga Schalke won in Dusseldorf by the results of Weston McKennie and Guido Burgstaller 2-0. For Schalke it is time to finally get his head out of the noose and work successfully again. The tender upswing is gone by the defeat against Gladbach. Now a new series has to be started, preferably directly on Wednesday in the cup. However, the miners have a bad home record. In the Bundesliga there were six home defeats in ten home games. This is the all-time negative record for the Royal Blues in 51 years Bundesliga. Dusseldorf, on the other hand, is in a good mood and has scored seven points in the league in the last three games. Nevertheless, we tend with our prediction towards the home side before the game between Schalke vs Dusseldorf. The Schalke have lost in the Bundesliga six of ten home games. Dusseldorf has scored seven points away from three games away from home. The Fortuna has competed five times in Schalke on Schalke and has lost five times. The trophy is the last straw for Domenico Tedesco to end the season fairly conciliatory. In addition, the Schalke have won all five previous cup games against Dusseldorf in their own stadium, We can already imagine that the miners will do hard, but think that they should prevail in the end. We would therefore risk a tip on a home win in the second round between Schalke and Dusseldorf.